A few decades ago, yoga was the subject of only philosophical debates and study, very few people knew the practical side of it. It was Swami Sivananda (of Rishikesh) who completely changed the approach towards yoga. He presented before the people the practical and more scientific aspects of yoga. Indian culture has always been rich in terms of philosophical ideas, but teachings of Swami Sivananda equipped the people with certain techniques and modalities through which they could lead a life full of health, creativity and mental, emotional as well as spiritual fulfilment. Swami Sivananda gave a very clear mandate to his disciples to propagate yoga in society. Swami Satyananda who was a disciple of Swami Sivananda; was given the mandate to spread yoga from door to door and shore to shore. Swami Satyananda and his team of disciples systematized the entire system of yogic practices and made them easy and graduated so that any person could benefit from the practices regardless of his state of health physical, mental or otherwise. In 1964 he founded Bihar School of Yoga in Munger (Bihar province). Yoga became established as a therapeutic tool, as an aid in training, as the ideal lifestyle, as a means for total education. He made the practices easily intelligible to the modern mind. 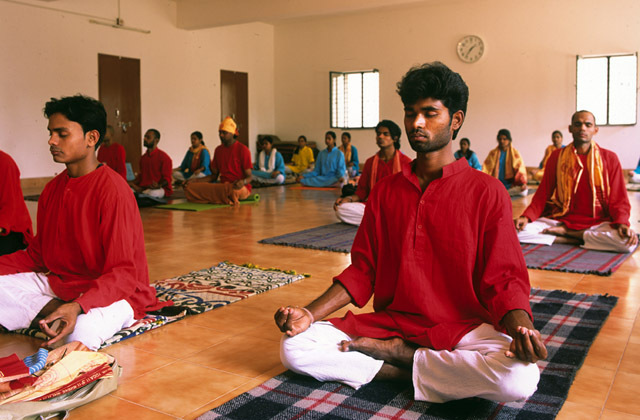 Today Satyananda yoga is respected worldwide as the authentic yoga tradition and in India, it is known as Bihar yoga. Yoga has been known to be the science, which addresses the issues like awakening the dormant faculties and refinement of the human mind. Any person feels that he needs to improve in certain areas, but then he finds himself helpless when he does not find an appropriate technique or a way out. There is no one science in the present education scenario, which can take care of this requirement completely. There are exercises for physical fitness, which again address limited parts of the body. And in spite of recent advances in psychology, there are no standard practices to improve the quality of the mind. Yoga is the only system, which provides a “complete” methodology for the development of total human being. “Satyananda yoga” has developed a series of graduated practices, called the pawanmuktasana, which makes it easy for a beginner to start the practices. A beginner on the path will not be able to do complicated postures because his joints are stiff and his body is not flexible. Pawanmuktasanas are a boon for him. It is this system of graduated practices that make “Satyananda Yoga” accepted so easily worldwide. It does not mean that the system caters only to beginners on the path, (and there are practices which are very advanced), but it means that an aspirant has to go step by step and cannot really take jumps. “Satyananda Yoga” makes one develop “awareness”, that quality of alertness, which makes a person stand apart. A person who is aware is balanced, awakened to life experiences, has clarity of mind under all situations and acts efficiently. Developing awareness through yogic practices is the hallmark of “Satyananda yoga”. One very important complementary practice of “Satyananda yoga” is the practice of pratyahara or withdrawal of the senses. The gross mind is normally totally extroverted in the waking or aroused state and is always busy in responding to the input from the senses in the form of sight, sound, taste, touch and smell. In this way, it gets overloaded and accumulates stress, because there is no knowledge of how to stop this process. In yoga, there is a methodical process to stop this overloading so that the mind comes to a state deep rest and relaxation. Swami Satyananda has founded a very simple and highly effective practice of progressive mental relaxation called Yoga Nidra, which is the trademark of Satyananda yoga tradition. This practice has been instrumental in helping psychosomatic problems like hypertension, diabetes, asthma etc. The modern medical science has not been effective in treating these diseases because there is no technique available to ease the mental tensions. The practice of yoga nidra is complementary to the package of practices and it makes it easier for the other practices of asana and pranayama to take root. Only when the deeper tensions are removed can the body-mind absorb or assimilate other practices better. Satyananda yoga also accepts that there can be gross impurities in the physical body, which can bar one’s progress on the path of holistic and positive living. Modern lifestyle and habit patterns are the factors disturbing the equilibrium of physical and the mental health. The accumulated toxins in the physical body can be removed through the Hatha yogic process of shatkarmas or the six cleansing practices which cleanse the digestive tract, the sinuses, the frontal lobe of the brain, the inner and the outer vision, the prana vayus and doshas. Thus through the collective practices of the Satyananda yoga one finds the centre of existence within oneself as awareness grows and there is spontaneous flowering of “inner discipline or Anushashanam, the system of Satyananda yoga does not restrict the yogic practices to the practice room only but it believes in the principle of taking yoga into one’s life and living yoga and life with awareness and fullness.